I don't have Windows... I'll cycle back to this. Those slime effects are great! Really made me laugh. Playing the game properly wasn't that engaging, but playing with the slime ball was fun. Also I had some slideshow-tier frame rate issues when there was a dozen or so of those cylinder enemies on screen. It added to why the game part wasn't so fun for me lol. I almost wish this game was just a sandbox playground thing instead. Like the tutorial to We Love Katamari or something. 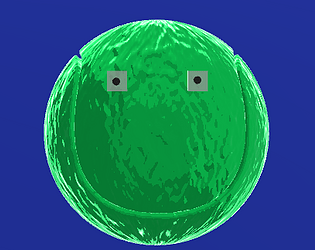 A few objects to interact with, but it's mostly about experiencing being a jiggly slime ball. As a toy, I like it. Nice job on the jigglin'. I really loved the effects and slime physics. The game play was simple, but fairly fun and I liked it overall.